In Refinishing My Les Paul BFG Part 2, Luca Quacquarella, our friendly local Italian luthier had stripped the thin gold finish and sanded down the top of the guitar to the bare wood. Gone were the BFG's bumps, ridges and 'scales'. Also gone was the weird little groove that used to reside where a pickguard normally would attach to the body with a screw -- something that exists on no other Gibson Les Paul. 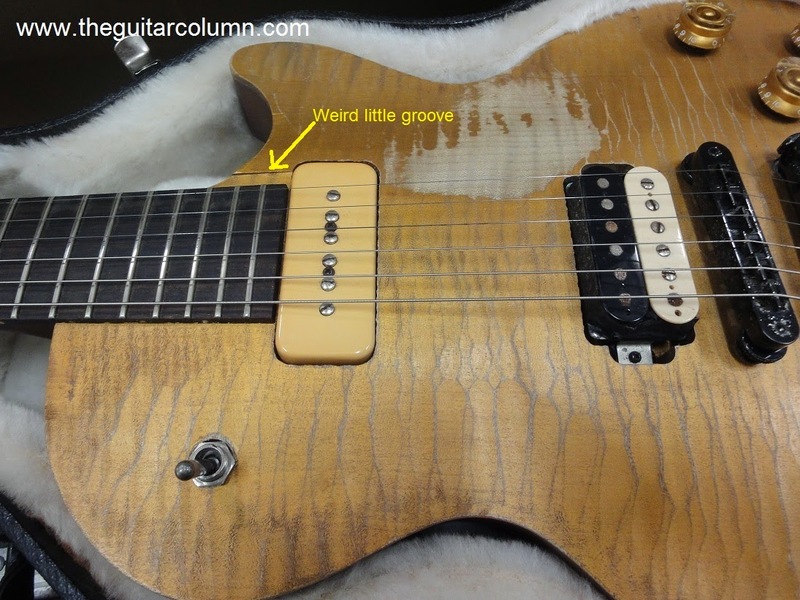 I've always speculated that the groove was intentionally put there to prevent a would-be forger from using the BFG as a base for a counterfeit vintage Les Paul. Mucho dinero for a couple of weeks work. 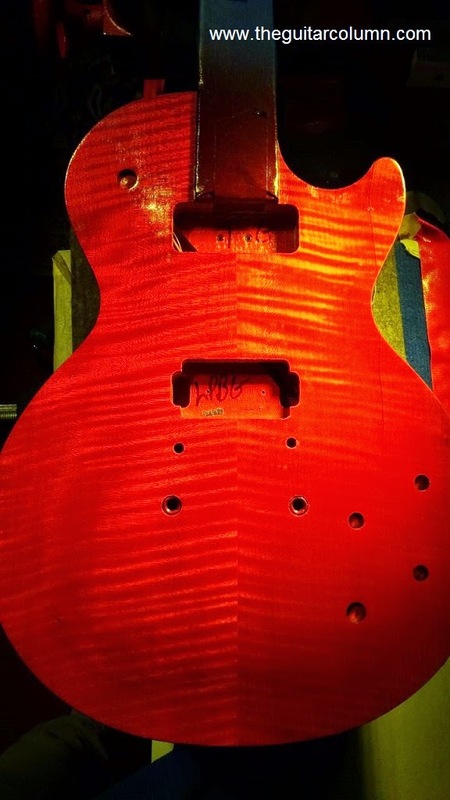 The next step was for Luca to mix red and orange colors of nitrocellulose lacquer to come up with a convincing vermillion. Vermillion is a tricky color to achieve. Too much orange or too much red and the scale can tip either way. After some experimentation, Luca sent me these pictures which show the first coat of nitrocellulose lacquer he had applied. Spraying the lacquer, fine sanding and then spraying again, several times over, he was able to build a nice intense gloss that also accented the grain and figure of the maple top. 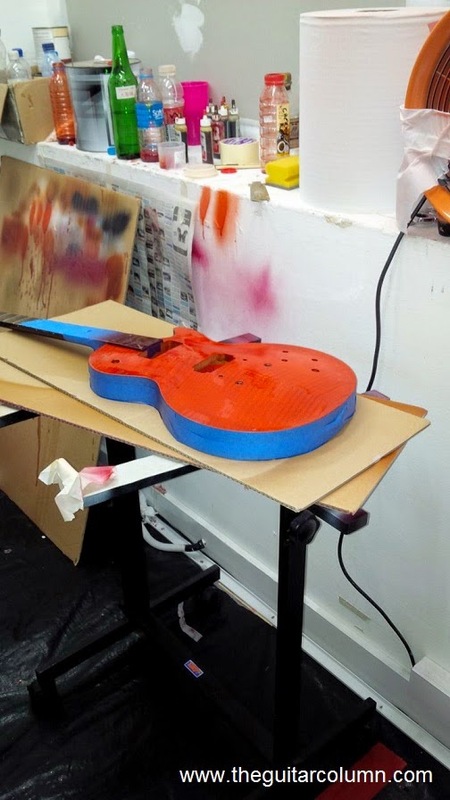 After about a week, and after Luca had let the nitrocellulose dry thoroughly -- a process slowed by Singapore's 90% humidity -- the guitar was ready to have all its hardware put back on. BFG's come with the bridge humbucker screwed directly into the body. I never liked the sound of a pickup mounted directly to body -- it gives the guitar a hard, very harsh sound. It's subtle but you can definitely hear it as well as feel it. 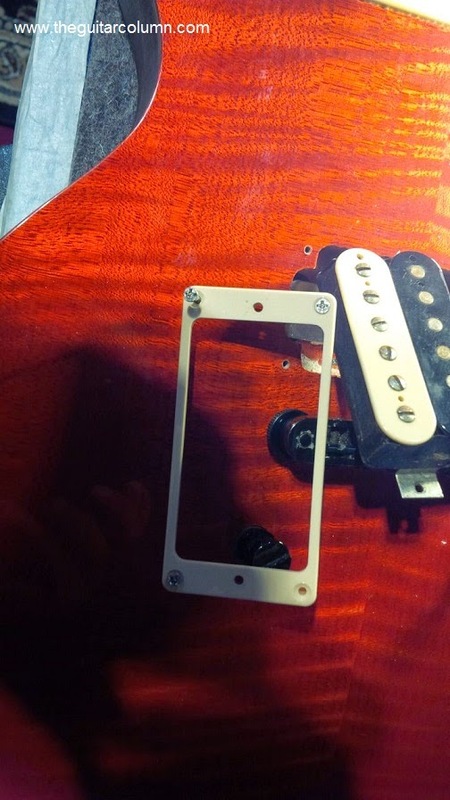 Humbuckers need to be spring mounted in order to 'breathe' and sound natural. I'd also been having problems with the bridge pickup suddenly coming loose -- the pickup screws were not holding properly to the body -- with the springs underneath forcing the pickup up and into strings while I was playing. It happened once at a gig and I had break out the phillips screwdriver mid-song to screw the pickup in deeper into the body. Not something that I would like to repeat doing. I needed to get an original Gibson pickup mounting ring, an item which all the music stores in my location were plum out of. Fortunately, a friend of mine managed to procure one for me from a music store in Tokyo while on a business trip there. provided the necessary tension to support the pickup and the ends of the screw threads screwed right to the body. As you can imagine, if the mounting ears were indeed unthreaded, it would have been impossible to mount the pickup to the mounting ring. Fortunately, Luca didn't find this anomaly on my BFG's Burstbucker, so he managed to install the mounting ring and the pickup in the conventional manner without any problems.